After hearing so much about the benefits of raw cacao powder I decided to try some a few days ago. I forked out the $$ for some organic raw cacao powder and made myself a hot chocolate with it, with a little cinnamon. From what I’d heard it was going to be very bitter and an acquired taste, so I braced myself for the first sip… and found it delicious! In fact, I thought it tasted exactly like I’d made a hot chocolate with cocoa powder (i.e. not the drinking chocolate you buy which has added sugars etc.). So I began to wonder, just how different is raw cacao powder from unsweetened cocoa powder, given that they are both derived from the same fruit? Cacao and cocoa powders are very complex, containing in excess of 300 chemically distinct compounds, making them the most complex of all foods. Rich in antioxidants: Raw cacao powder is extremely rich in beneficial plant polyphenols. The most beneficial of these are flavanoids, which are antioxidants. In fact, cacao powder contains far more antioxidants per 100 g than acai berries, goji berries and blueberries. Antioxidants comprise a whopping 10% of the weight of cacao powder. There are two flavanoids in cacao powder which are particularly beneficial; catechin and epicatechin. Antioxidants neutralise free radicals, which are unstable electron-deficient molecules which react with other molecules to gain electrons. Free radicals can cause DNA damage which contributes to ageing and formation of cancer. Antioxidants also prevent oxidation of LDL cholesterol in the blood, which causes atherosclerosis. Oxidation of LDL cholesterol causes it to enter the endothelial layer of blood vessels where it activates the endothelial cells and cells of the immune system to initiate inflammation. This ultimately forms inflamed and unstable plaques which bulge into the arteries and block blood flow, or rupture and cause blood clotting, stroke or heart attack. By preventing LDL cholesterol oxidation, antioxidants reduce the risk of atherosclerosis and cardiac arrest. Regulates blood cholesterol: The flavinoids in cacao powders also regulate blood cholesterol by increasing HDL (“good” cholesterol) levels and reducing LDL (“bad” cholesterol) levels. This is partly due to increasing levels of Apo A-1 protein which clears cholesterol from blood vessels. Regulates blood glucose and fat metabolism: Flavinoids have also been shown to increase production of the hormone adiponectin, which regulates metabolism of fatty acids, improves insulin sensitivity and regulates blood glucose levels. In this way, adiponectin can improve weight loss and reduce obesity, type II diabetes and atherosclerosis. High in dietary fibre: Cacao powder is surprisingly high in dietary fibre. Although some people may be concerned on seeing the high carbohydrate content on the nutrition label, you should note that cacao powders are very low in sugar and the majority of the carbohydrate content is fibre. Fibre, of course, is not digested but absorbs water in the large intestine to form stools which keeps you regularly eliminating the solid waste from your system and has been shown to contribute to weight loss. Be careful if you eat too much cacao or cocoa powder as you may get a stomach ache! Increases weight loss: In addition to the factors mentioned above which contribute to weight management, consumption of cacao powder by rats was shown to increase production of uncoupling protein-2, which is a thermogenic protein. Thermogenic proteins essentially disrupt part of the energy-making process so that lots of fat or glucose must be burned to make the same amount of useable energy, and the rest is lost as heat. This both maintains body temperature (hence the name thermogenic) and raises your rate of metabolism. Contains compounds which make you feel good: Cacao powders contain the neurotransmitters dopamine and phenylethylamine (PEA). PEA aids mental alertness, improves mood and helps with weight loss. Magnesium: Cacao powders have the highest source of magnesium of all foods. Magnesium is important for bone and teeth formation, transmission of nerve signals and muscle relaxation, and secretion of the parathyroid hormone which controls calcium levels in the blood. Magnesium also helps the body process fat and protein, and is important in the production and activity of some enzymes. Magnesium deficiency is the most common mineral deficiency in the Western world. Sulphur: Sulphur is essential in the formation of many proteins and enzymes in cells, and is important for healthy hair, nails, skin and connective tissue. Sulphur also promotes detoxification in the liver and good pancreas function. It is also important for the production of vitamin B1 and biotin and for the conversion of carbohydrates into useable energy. Iron: One 28 g serving of raw cacao powder contains 314% of the recommended daily intake of iron. Iron is essential for the production and function of haemoglobin which carries oxygen molecules in the blood. It is also important for the activity of many enzymes and other proteins such as myoglobin in muscle cells and enzymes in glucose and fatty acid metabolism. Potassium: Potassium regulates blood acidity, lowers blood pressure, and is important for the normal function of muscle cells, nerve cells, the heart, kidneys and adrenal glands. Phosphorus: Phosphorous is essential for healthy bones and teeth. It is also important for formation of ATP and other molecules. ATP is the useable energy source derived from metabolism of glucose and fatty acids in our cells. Calcium: Calcium is the main component of bones and teeth. It is also important for cell signalling, muscle contraction, and blood clotting. Although cacao powder is high in calcium, it is not a good source for it because it is also high in oxalic acid which prevents the calcium from being absorbed. Folate: Folate is important for making DNA and RNA, formation of new cells, and forms part of haemoglobin which carries oxygen in red blood cells. Both cacao and cocoa powders are produced by grinding cocoa nibs to a paste or liquor and then removing the cocoa butter (the fat component of the cocoa). To make cocoa powder the cocoa paste or liquor is hydraulically pressed to remove the cocoa butter, and this process generates lots of heat, frequently in excess of 150 degrees C. There are two types of cocoa powder; natural and Dutch-processed. 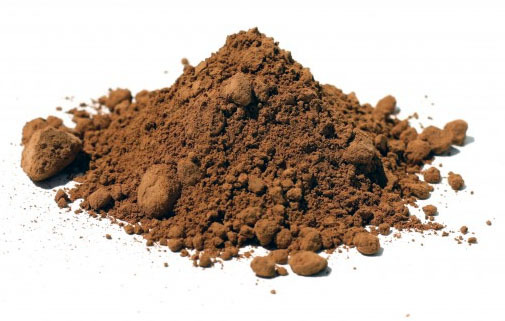 Natural cocoa powder is reddish-brown in colour, very bitter to taste and has an acidic pH of around 5.3-5.8. The second type, Dutch-processed cocoa powder, undergoes an extra step at the beginning of production where the beans are soaked in potassium carbonate to alkalize the pH to a more neutral 6.5-7.6. Dutch-processed cocoa powder is darker in colour and less bitter. 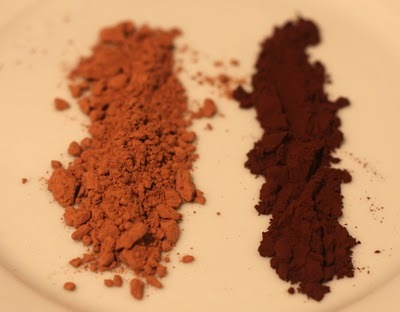 Natural cocoa powder (left) and Dutch-processed (alkalized) cocoa powder (right). The difference between these two cocoa powders and raw cacao powder is that during the production of raw cacao powder, the cocoa butter is removed by cold-pressing. The temperature is constantly monitored to ensure it does not exceed about 40 degrees C.
Is “raw” cacao really raw? This appears to be a very pressing question on the net. The main concern is that a lot of heat is produced during fermentation, and to prevent the cacao from ‘cooking’ during this production step much more time and different methods or equipment are required. 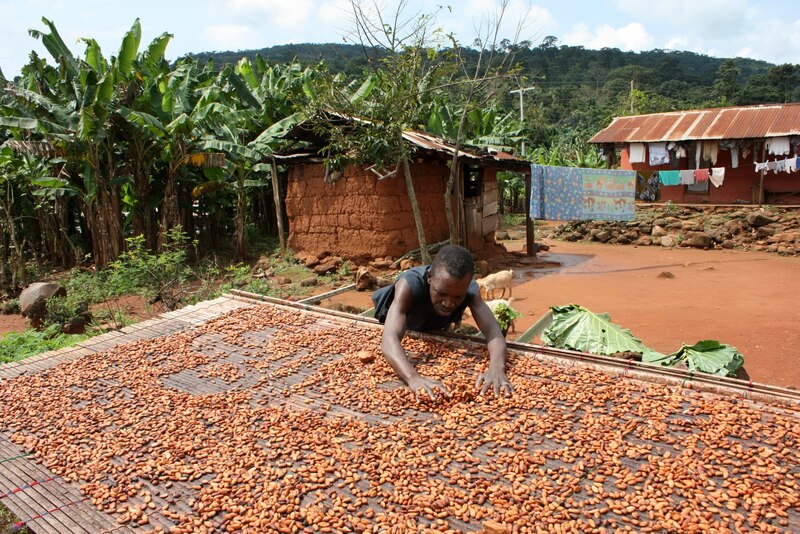 Since most cacao is produced in third-world countries, cost-cutting and large-scale production may result in failure to regulate the temperature properly. Cold-pressing the cacao liquor is also a time-consuming and more expensive process than hydraulic-pressing. Cacao beans fermenting in the sun, a popular method, but one which does not allow for temperature control. At present there are no third party organizations which certify cacao powders as raw, and the manufacturing process is not always monitored closely, particularly at the fermentation step. Basically, the consumer must rely on the good faith of the supplier that the cacao powder is “raw”. Similarly, many suppliers of cacao powder rely on the good faith of the producers in third-world countries. This has proved to be a problem in the past, where the Essential Living Foods company discovered and had to admit to its customers that its raw cacao powder was not really raw. It now sources its raw cacao powder elsewhere and monitors the process. Does the difference in production of raw cacao and cocoa powders affect the antioxidant activity? Since natural unsweetened cocoa powder is very similar to raw cacao powder except for experiencing higher temperatures during production, the question is, does natural cocoa powder have the same benefits as raw cacao powder? The main beneficial property of raw cacao powder is antioxidants. Antioxidant activity is measured as an Oxygen Radical Absorbance Capacity (ORAC) score. Foods with higher ORAC values have more antioxidant activity. The ORAC score for raw cacao powder is 95 500 μ mol TE/100g, compared with 26 000 μ mol TE/100g for roasted cocoa powder (I cannot find a source clarifying whether this is for natural or dutch-processed cocoa powder). So raw cacao powder has 3.67 times the antioxidant activity of roasted cocoa powder. 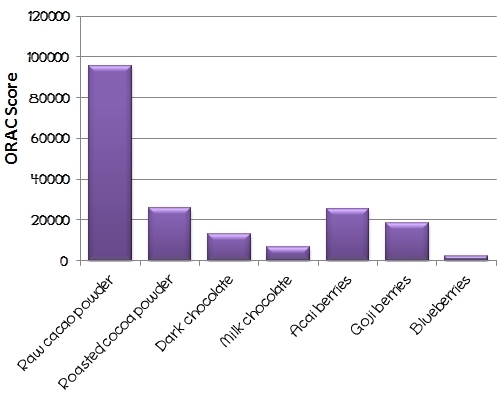 Comparison of the antioxidant activity of cacao, cocoa and chocolate with some antioxidant-rich berries. The process of alkalizing Dutch-processed cocoa powder has been shown to drastically reduce the ORAC score of the cocoa, which could be attributed to the linear decrease in flavanols present in the cocoa as the pH is increased (Miller et al., “Impact of Alkalization on the Antioxidant and Flavanol Content of Commercial Cocoa Powders” J. Agric. Food Chem. , 2008, 56 ). In fact, Dutch-processed cocoa powder contains up to 90% fewer antioxidants than natural cocoa powder. In short, raw cacao powder is definitely the healthiest, most beneficial of the powders, followed by natural cocoa and finally Dutch-processed cocoa. The antioxidant activity of cacao/cocoa powders is affected by temperature and pH. So the next question is, does the use of raw cacao powder in hot chocolates and baked recipes also reduce its antioxidant activity? It is known that heat destroys flavanols and other antioxidants including some vitamins, and there is a clear difference between antioxidant activity in raw cacao powder and natural cocoa powder measured by the ORAC score. Therefore I believe it is reasonable to assume that the addition of the heat of boiling (or near to) water, or the process of baking, will destroy some of the antioxidant activity of raw cacao powder, making it not “raw” anymore but something more akin to natural cocoa. So is it really more beneficial to use raw cacao instead of natural cocoa in recipes where you will be applying heat? I cannot find any studies looking at the relationship between time heated and antioxidant activity. It is my belief that prolonged exposure to heat or repeated heating (eg. during production and subsequently cooking at home) will destroy more of the antioxidants in cacao/cocoa powders, although as I said this has not been shown scientifically either way. Therefore if you are going to be cooking the raw cacao in any way (in baked recipes or in the making of hot beverages) you will no doubt be destroying the antioxidants. This is not to say it is not still beneficial. The ORAC scores clearly show that roasted cocoa powder still has extremely high antioxidant activity, about the same as acai berries and much higher than other antioxidant-rich foods. It’s just that it is less beneficial after it’s been heated than when the product was raw. The addition of milk to cacao or cocoa powder has been shown to inhibit the absorption of the antioxidants. Therefore the antioxidants in milk chocolate are far less available to our bodies than those in raw cacao, cocoa or dark chocolate. Pathogens: Stephanie Zonis describes some of the conditions in which cacao plants are grown and cacao beans are fermented, and the potential risk of pathogens which may arise because of this (http://www.sallybernstein.com/food/columns/zonis/raw_chocolate.html). Most cacao or cocoa is harvested from beans grown in third-world countries, and many of the conditions these beans are exposed to during growth and fermentation is extremely unsanitary. She explains that consumption of raw organic cacao powder may drastically increase the risk of pathogen-associated illnesses (or food poisoning) because the cooler temperatures may allow pathogens to survive. However, pathogenic risks are also associated with the addition of egg and dairy products to cocoa powders during the production of chocolate. Oxalic acid: Oxalic acid inhibits calcium absorption. Oxalic acid is converted to calcium oxalate which precipitates to form kidney stones, which can result in kidney failure and death. Oxalic acid is toxic to humans, although small amounts may help reduce formation of cancerous tumours since it inhibits the enzyme lactate dehydrogenase which is important for the final step of anaerobic respiration. Many solid tumours use anaerobic respiration as the main source of energy, and inhibition of lactate dehydrogenase results in reduced energy in these cells and ultimately cell death or failure of the tumour to expand. Theobromine: Cacao and cocoa powders do not contain caffeine as popularly thought, but do contain the related molecule theobromine which stimulates the nervous system and heart. Although it has less stimulatory power than caffeine on the nervous system, it is a greater stimuator of the heart. Theobromine is the reason dogs and other animals cannot eat chocolate, since they lack the enzymes to metabolise it and it will cause cardiac arrest. Theobromine also has a mild diuretic effect and is a vasodilator. The increase in heart rate and dilation of blood vessels by theobromine causes low blood pressure. Like caffeine, theobromine causes you to feel hyper for a while and then lethargic. It can also cause headaches in some individuals. Studies show a very small amount of dark chocolate daily is good for you. The beneficial effects of chocolate are due to the cocoa component. Since you only need a small amount of cocoa or raw cacao powder to experience these benefits,they can be quickly be outweighed by the high intake of sugar in chocolate if you consume too much. Commercial drinking chocolate contains added sugar, milk solids and a high level of saturated fats so it’s best avoided. To summarise, there is a clear difference between raw cacao and cocoa powders when it comes to the amount of beneficial antioxidants present. Raw cacao is by far the highest in antioxidant activity, followed by natural cocoa powder and lastly Dutch-processed cocoa powder. This is because the antioxidants are destroyed or converted to forms that cannot be absorbed when the cocoa is heated or subjected to chemical treatment (Dutch-processed) during production. Although raw cacao is one of the richest sources of antioxidants for weight, it should not be consumed in excess because of its oxalic acid and theobromine content. The extremely high amount of dietary fibre may also disagree with some people when consumed in excess! It is far more reasonable to eat lots of acai berries or goji berries than the same weight in raw cacao powder. Also, it is important to keep in mind that raw cacao powder is only better than natural cocoa powder because it has not been subjected to high temperatures, so it is probably no more beneficial to use raw cacao than natural cocoa in recipes that require heating, including hot beverages. This is not to say natural cocoa is not beneficial – it certainly is, and you should use this in your baking instead of Dutch-processed cocoa powder or chocolate itself, or in hot chocolates instead of drinking chocolate mixes which contain lots of added sugar and fat. It’s just that if you are paying the extra (which can be a fair bit extra) for raw cacao powder, you probably want to use it in raw recipes in order to retain its goodness. Keep in mind also that the addition of dairy products can inhibit absorption of the antioxidants from raw cacao and cocoa powders, so use non-dairy milks such as rice milk, soy milk or almond milk in your hot chocolates or better yet, just use water. Finally, there are benefits to eating a small amount of dark chocolate because of the cocoa. Just be careful not to overindulge! If you feel there are important issues I’ve missed or there are things you disagree with, please comment below! Good am. thanks for sharing tips for health god bls. Good am. thanks for sharing tips for good health god bls. You don’t mention the different effect on the heart between natural cocoa and cacao. Hi Genevieve, I’m unaware of any differences in effects on the heart between natural cocoa and raw cacao. Thanks for asking!